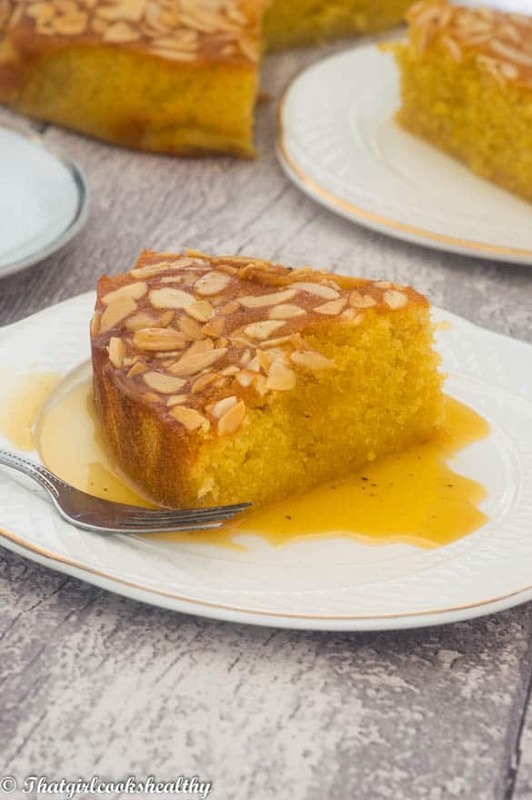 Flourless orange almond cake – and extra moist flourless orange almond cake with a hint of cornmeal with complimentary orange syrup. Lately I’ve been thinking about making a few cake and pudding recipes and the reason for this is because extra sweet treats are actually my weakness. Yes I’m not afraid to admit that in lack strength in certain aspects of the culinary world. Contrary to popular belief, us foodies aren’t born geniuses we have to cultivate and harness of skills. As I have always said, there is plenty of trial and error that goes on this Charla’s kitchen. 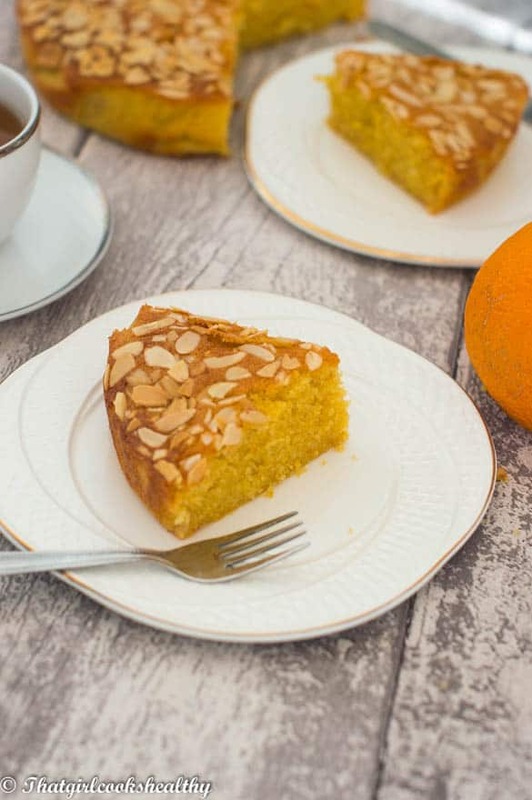 However, this flourless orange almond cake was definitely a hit and one that I have made over and over again to ensure I get the exact same results each time before posting the recipe on the blog. 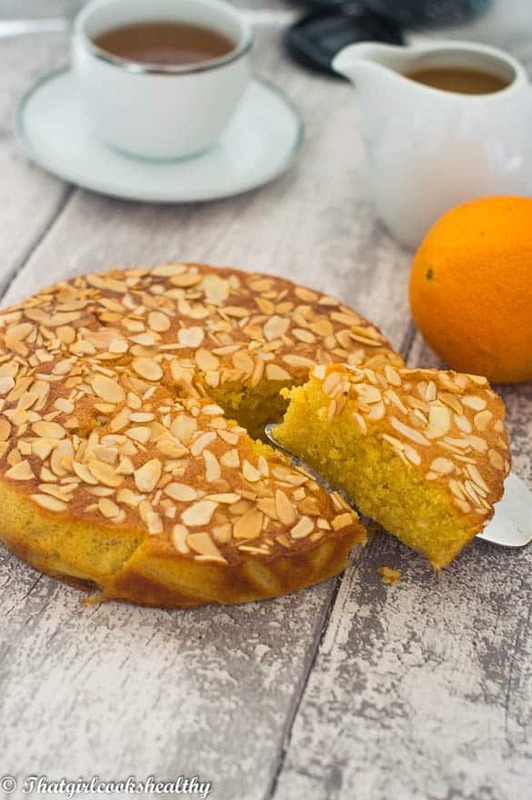 Flourless cakes are the way forward now, gone are the days for using conventional flour and with so many people with dietary requirements more and more people are seeking alternative ways to make the favourite food and lead what’s considers a normal lifestyle. Looking more into the gluten free aspect where gluten – a type of protein found in wheat, barley rye which helps with the structure of flour is known to cause adverse effects such as bloating, cramps, constipation, diarrhoea just to name a few digestive problems. People who are gluten intolerant more often than not advised to avoid wheat based flours. This omission results in a complete dietary change which can be initially overwhelming. 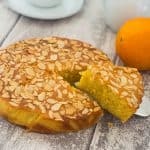 My flourless orange almond cake is a classic example of what’s gluten free friendly – the clue is in the name! No flour and the key ingredient to this extra moist cake is……drum roll……. ground almonds! 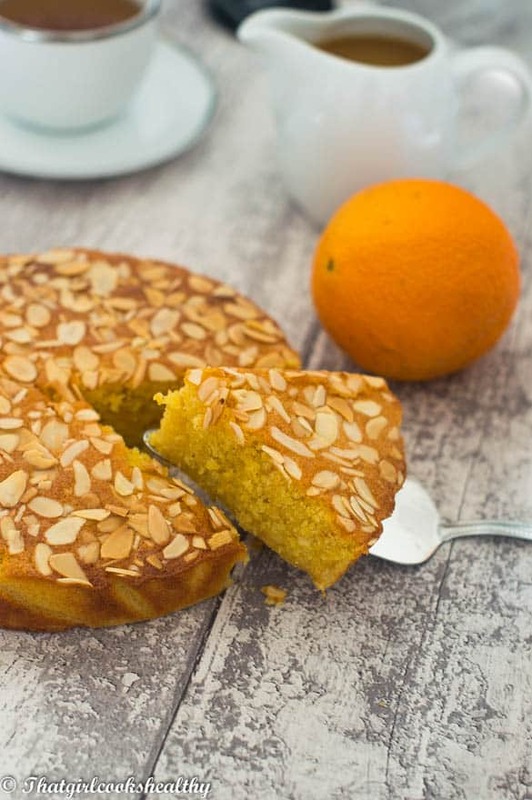 Ground almonds make the BEST cakes – super light and extra fluffy! My gluten free rendition of the classic Jamaican toto was made using ground almonds and so was my flourless chocolate almond cake . 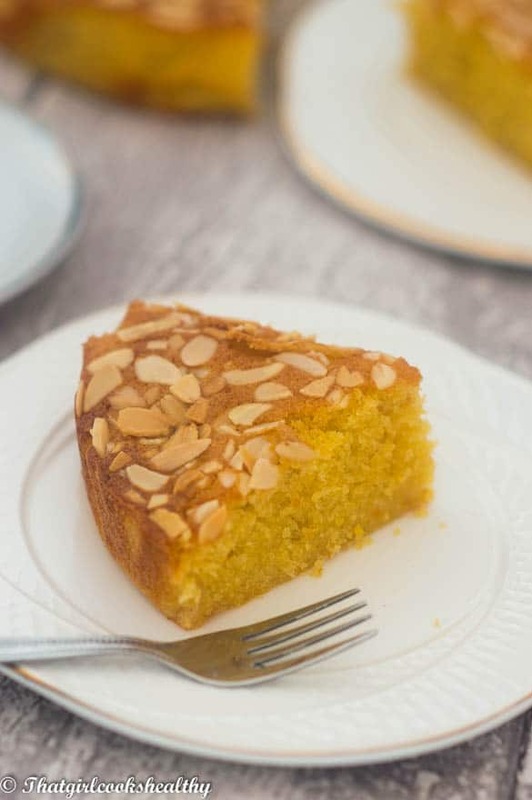 These are just two examples of light and fluffy almond cake that are so easy to make at home. Place the butter and sugar in a bowl, using an electric whisk on the slowest speed cream the butter and sugar. Increase the speed to create a light and fluffy mixture. Gradually add the beaten eggs continuing to whisk all the time until all 3 ingredients are evenly combined. 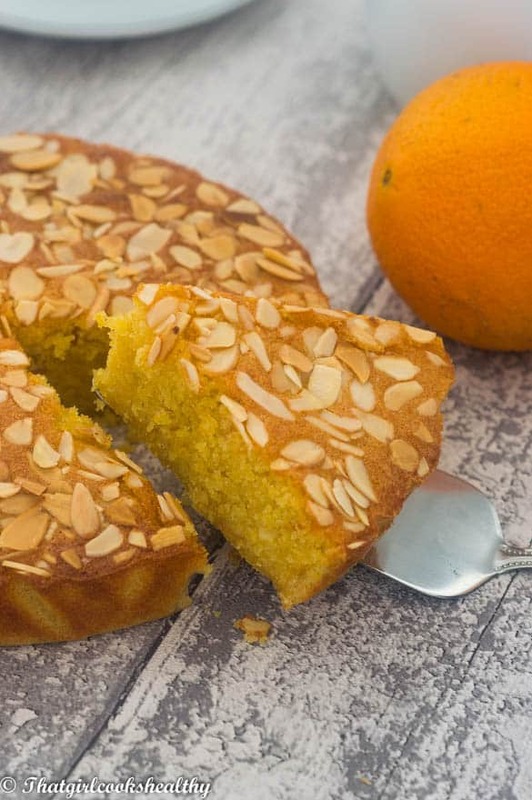 Use a wooden spoon to stir in the ground almonds then fold in the cornmeal, almond flakes, baking powder, vanilla extract orange zest and juice. Mix everything together into a smooth cake batter. scoop the batter into the cake tin and bake in the oven for approximately 35 minutes or until metal skewer (can use a knife) comes out clean. Prepare the orange syrup by adding the orange juice and coconut sugar to a small saucepan. Bring to the boil while stirring before reducing to a simmer. Continue to mix until the orange darkens and the juice becomes a slightly thick syrup texture. This should take 5-10 minutes. Don’t worry if the syrup isn’t extremely thick while warm it will thicken as it cools down. Yes, stevia would work fine. Any granular sugar so long as it’s low glycemic should be a good replica. What size cake pan did you use in this recipe? is there a substitute for eggs? Can almond flour be used in place of ground almonds? And what would the amount be? Hi Nadine. Yes you can do a direct substitution of almond flour in place of almond meal and the results should be the same.